Free T-Shirt! 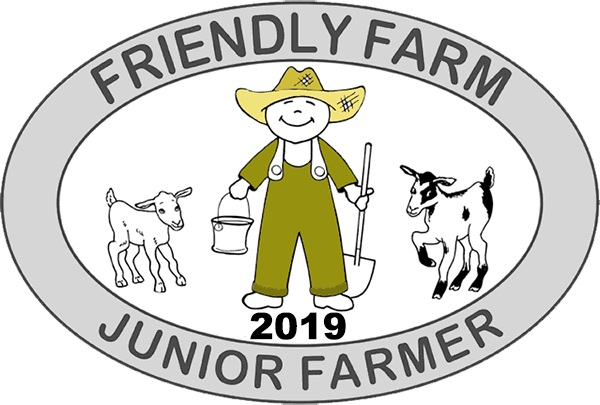 - Wear your Friendly Farm Junior Farmer T-shirt with pride. It's your ticket to admission here at The Friendly Farm. Free Admission - Once you become a Junior Farmer you can come as often as you like to visit us during the 2019 season, just wear your T-shirt! Free Bag of Feed every time you visit! Special Recognition - We appreciate our Junior Farmers and offer special "chores" they can participate in during their visit. In addition to the above items, you'll receive a 10% discount off any purchases in our Gift Shop. Whether you visit us twice during the season or ten times, your Junior Farmer Membership (ages 1 to 12) pays dividends. Your membership is good for the entire 2019 season. Fill our the order form below and we'll ship it right to you!